With over 600 green spaces, parks and golf courses, Surrey has the highest number of golf courses out of any community in Metro Vancouver or the Fraser Valley! Each of Golf Surrey’s four partner courses offer a different style of golf, from links style courses to championships greens, there’s something for every type of of golfer. 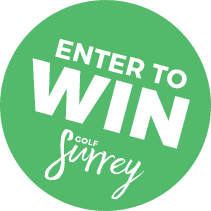 Enter to win the Golf Surrey sweepstakes for a chance to experience everything Golf Surrey has to offer! Two (2) Golf Surrey Passes*, each Golf Surrey Pass entitles the holder to a round of golf at each of our premier partner courses: Hazelmere Golf and Tennis Club, Morgan Creek Golf Course, Northview Golf and Country Club, and Peace Portal Golf Course. Two (2) nights stay at the Holiday Inn & Suites Cloverdale. The contest has now concluded. Please check back soon for future contests and giveaways! Golf Surrey is a Discover Surrey initiative in partnership with Morgan Creek, Northview, Hazelmere and Peace Portal Golf Courses. The goal of Golf Surrey is to bring Surrey and its patrons good golf. © 2017 Golf Surrey. All rights reserved.